A new FREE publication is now available from UC ANR: “Sustainable Landscaping in California: How to Conserve Resources and Beautify your Home Landscape” (ANR Publication 8504) Sustainable landscaping is a gardening approach focused on matching the plantings and design to a plot's native complement of soil and water resources and local climatic conditions. In the long run, the garden costs less and takes less time to maintain. Download it now - FREE! The olive fruit fly is a recently introduced pest from the Mediterranean that lays eggs in olives. The larvae eat the fruit, ruining it for table use and oil production. Fortunately, the fruit fly is not difficult to control. This list of both print and web resources accompanies the Alameda County Master Gardeners’ sustainable landscaping presentation titled “Smart Gardening: Seven Sustainable Practices for Today and Beyond.” The list includes a section of general resources and sections of specific resources for each of the seven practices. 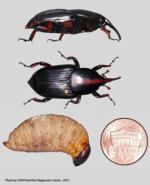 Agricultural officials have confirmed the detection of a red palm weevil in the Laguna Beach area of Orange County - the first-ever detection of the pest in the United States. The weevil is considered to be the world’s worst pest of palm trees. An infestation typically results in the death of the tree. Concerned about the problems associated with gardening in lead-contaminated soil? A new pest has been damaging fruit in California. It is the Spotted Wing Drosophila. Read more about it at its UC IPM Page - HERE. The latest news on the light brown apple moth is that it has been trapped in a single neighborhood Dublin. Previously, it had only been found on the west side of the hills, but now it's spread to the east county as well. As you may already know, the light brown apple moth is an insect from Australia that has a wide array of host plants and is threatening the agricultural business in our state. So far it hasn't hit the San Joaquin Valley, and state officials would really like to keep it that way! Deputy Agricultural Commissioner, Cathy Roache has asked us to help get the word out about this pest. It's very important that plant materials or produce from your yards, gardens or our demo gardens NOT be taken out of the county into a non quarantined area, and it would make good sense to fully inspect any plant material before transporting anywhere within the county as well. For the latest information on the quarantined areas, you can check the website at the California Department of Agriculture.